The Walking Dead still has plans for Maggie, even if they might have to wait for Lauren Cohan to get to them. Lea Thompson still wants that new Howard the Duck movie. Matt Reeves talks about the Jekyll and Hyde dichotomy of The Batman. Ducktales’ second season has some very fun guest stars. Plus, what’s to come on Van Helsing and The Gifted, and Rick Remender discusses the upcoming adaptation of Deadly Class. To me, my Spoilers! In a new interview with Comic Book, Lea Thompson stated Marvel “loved” her Howard the Duck reboot pitch, which she has been working on in secret with former Howard writer Chip Zdarsky and artist Joe Quinones. I worked on the pitch for a really long time and I had the help of [modern Howard the Duck comic book creative team] Chip Zdarsky and Joe Quinones and they had done a run of Howard the Duck, the last run of Howard the Duck, and they put me in it, Lea Thompson. And it was really great, so I asked them for help and Joe drew some drawings and Chip and I worked on the pitch and we did it in Marvel and they really liked it. They loved it, actually. But they were like, ‘We have no plans for these things, and we’re doing the streaming thing, and we’ll call you back.’ So tweet away, guys! It was a very good pitch. Zdarsky even offered visual confirmation of the team-up of Twitter. Deadline reports James Wan has signed on to produce an English remake of the South Korean zombie thriller, Train to Busan, from screenwriter Gary Dauberman (The Nun). Speaking with Indie Wire, Matt Reeves revealed his Batman script is heavily inspired by The Strange Case of Dr. Jekyll and Mr. Hyde. One of the things that I’ve found interesting, just as we’re working on the story, is looking back at Jekyll and Hyde, and the idea of your shadow-self, and the idea of, we are all multiple things. It’s different aspects of who we are, and I think there are times when maybe the surface of Bruce is not really who he is, but that’s his disguise. There are times when Batman’s the disguise, but there are times when his true essence comes out, because by being veiled, a kind of instinctual side comes out that’s very pure. A young woman dying of leukaemia teaches an alien about life on Earth in the trailer for Zoe and the Astronaut, actor Eke Chukwu’s low-budget directorial debut. 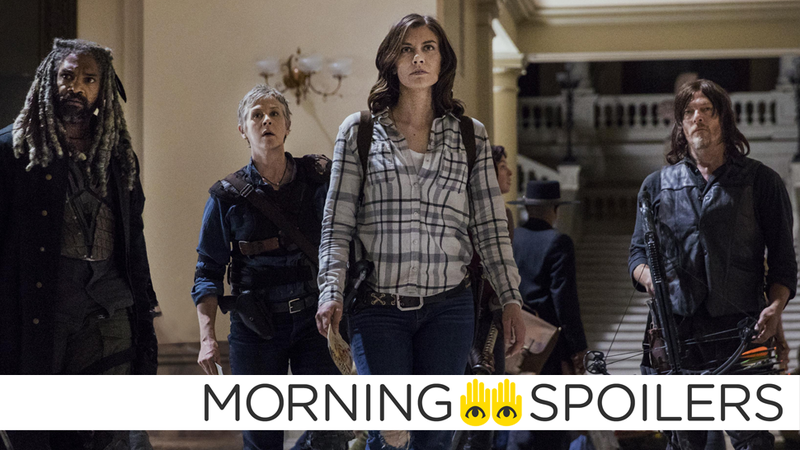 Showrunner Angela Kang hopes Lauren Cohan will return to wrap up Maggie’s story arc in season ten. I’ll say first of all that we’ve still planned some more story with Maggie, Lauren wants to, it will be a little subject to her schedule but hopefully we have her back next season. We have always planned to have this great story with Maggie this season and I think we promised something. We wanted to pay off that promise. We definitely have a very strong Maggie arc. A series of new synopses for the show confirms that Oscar Isaac will voice Poe Dameron in the first two episodes of the series, with Gwendoline Christie returning as Captain Phasma in episode 3. Plus, Lord of the Rings’ Elijah Wood will guest star in episode 4 as a character named Jace Ruklin. Edgar Wright, Julie Bowen, John Hodgman, Lance Reddick, Libe Barer, and The Good Place‘s Jameela Jamil are confirmed to guest star in season two of DuckTales. Spoiler TV has images from episode five, “Rise Up.” More at the link. A promo for next week’s episode, “unMoored,” shows us what to expect in season two of The Gifted. Syfy has two more quick teasers for the third season of Van Helsing. Sarah Jeffrey talks Charmed in a new interview with the CW. Finally, Syfy Wire has fifteen minutes with Rick Remender to discuss Syfy’s upcoming adaptation of Deadly Class.